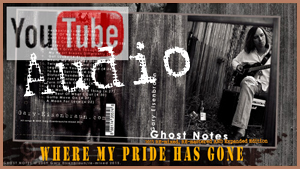 Gary Eisenbraun | Ghost Notes | "Where My Pride Has Gone". Where My Pride Has Gone. for what you left at my door. trying to make some sense of you. all the indecision that you put me through. I'd jump through your hoops. Wonder where my pride has gone. It's all a game for you. just what's inside of you. so I can plan my next move. as the one who does what it takes? But it's too bad for me. I'm the one who took the bait. to find out just how you feel. than to show what is real. Next song: Twisting In The Wind.